Why is training important to the manufacturer? Your product message is delivered uniformly across the country. Knowledge about your product is very important—the more the Beauty Advisor knows, the more she sells. Promote new product launches, seasonal promotions, special items with the kind of uniform message you want conveyed to your consumer. Demonstration is a big part of GeeWorks™ training so the Beauty Advisor can touch and feel and smell the products, see how they are used all of which heightens their enthusiasm for selling the product. Selling techniques are trained to “add-on” sales and increase your market basket. Measure particular product sales against a period without training and see the difference. 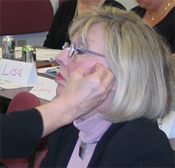 Why is training important to the Beauty Advisor? Knowing the product and the benefits for the consumer help close the sale. Knowing how the products work together helps to increase the sale and the market basket. Being trained on product information provides the opportunity for the Beauty Advisor to communicate with the consumer; the consumer's needs, her wants, her questions, to help complete the sale. Using selling techniques to move from product to product not only benefits productivity, but encourages the consumer to try more items. When she purchases more, you have created multiple reasons to come back to the store to repurchase those products. If each sale results in more than one item, that doubles her repurchase power. Learning about product and usage gives the Beauty Advisor confidence. She becomes more willing to assist the customer, creating a rapport with them. What is special about GeeWorks product training? Selling techniques are always included in GeeWorks training. We never train just on product, but always the techniques to “tie-in” another product/products. Our training is always inclusive of selling phrases. Those phrases are repeated during the course of the class, and that repetition is essential to improving selling skills. Knowing the product is important, but having passion about the product is yet another benefit. How the product works, extra selling tips/application tips, and demonstration of the product—that is how we train. Seeing is believing. We let the Beauty Advisors try the product, see how it is applied, and feel and smell the product. They fall in love with the product. Once the Beauty Advisor loves the product for her own use, she will show enthusiasm in selling to the consumer. Professional, experienced Trainers know how to romance the product, how to help build sales, and make the Beauty Advisors believers in your product. How do you know if the training is effective? Track your sales on particular products or product lines to measure against pre-training sales. View that the Beauty Advisors take the consumer to your brand versus those that have not provided training. When in-store, ask questions of the Senior Beauty Advisors to determine their knowledge.